Who can use this Constitution? This model form of constitution of a club is designed for use by a group of individuals who come together for the purposes of a sport or other shared interest. What is this Constitution for? It could be used for forming a sports club (a tennis, golf, gliding, rowing, sailing, bowling, football or snooker club, for example), and for a wide range of other activities. The Constitution will establish the relationship which the members have to each other and how they operate within the club. A club is often referred to as an unincorporated body. It is not incorporated like a limited company and it is not like a partnership which carries on a business for profit. An unincorporated body will have no real legal identity. The constitution will set out the name of the club, its main objects and the structure: in other words, who will be eligible as members and how will the club be run. Usually, there will be a committee responsible for day-to-day running of the club who will be elected by the members. The structure is similar to a limited company, with an annual general meeting when new committee members are elected and the accounts are approved. 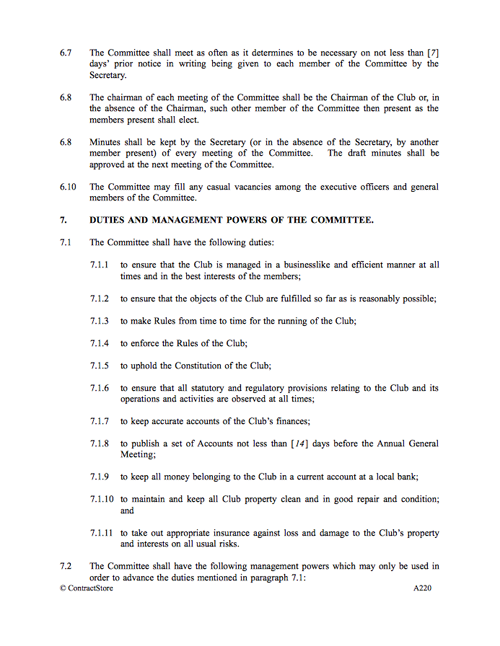 The duties of the committee and some of their procedure – e.g. how often they will meet – will be set out in the constitution. Membership fees and the handling of money will also be catered for as well as the establishment of rules of conduct for the membership. Two appendices are included, allowing for the formation of the club and amendment to its constitution. You need this document if you want to formalize a sport or other club, and set out its rules of governance and conduct. This Constitution is designed for use by members of a club who come together for the purposes of a sport or other shared interest. The members will be in a type of legal relationship with each other and this will give rise to rights and obligations both amongst themselves and to third parties. 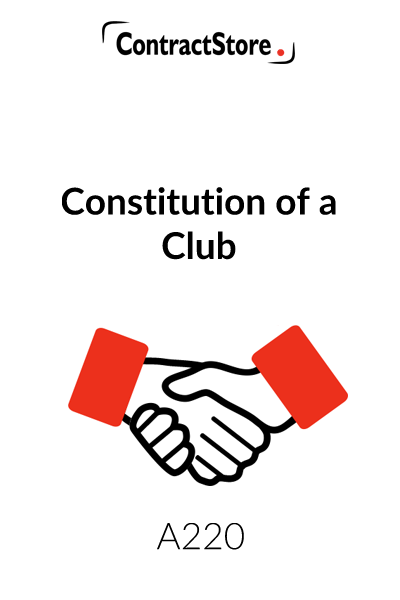 It is recommended that a formal written Constitution is used as this will establish the relationship which the members have to each other and how they operate within the club. A club is often referred to as an unincorporated body. It is not incorporated like a limited company and it is not like a partnership which carries on a business for profit. An unincorporated body will have no real legal identity. A Constitution may also be required for other reasons. It may be required so that the club can apply for grants from sporting bodies or to take out insurance to cover risks to which the club may be exposed. The draft Constitution contains all the standard provisions relating to membership, officers, a committee for management, formal meetings of the members, finances including accounts and the dissolution of the club. The Constitution is going to be a document which may well last many years without change and even though the membership changes. Amendments to the Constitution will require a vote at a Special General Meeting on notice and may not get passed. On the other hand, the rules of the club are made by the Committee and will deal with the more day to day operations and can be easily changed. It will be important to remember this distinction when considering whether to include an item in the Constitution or the rules. It is important that the club has a name and this should be unique. 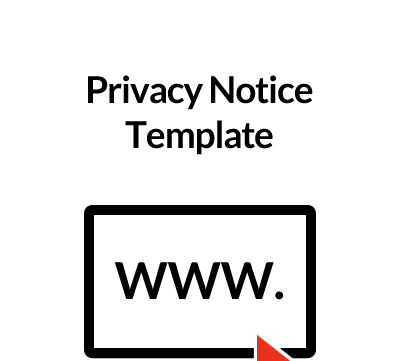 The name should not be identical or similar to a business as the owners of the business may have grounds to object and take legal action to prevent the use of the name. It may be advisable for recruitment purposes to use a name which easily identifies the club for what it does and perhaps its location. The objects of the club should be specified and this will ensure that the Committee does not become involved in operations beyond what the members expect. It may appropriate to refer in paragraph 2.4 to a particular Code which governs the activities if the Club. There may perhaps be a sporting code or rules of an association and, if so, the members may want the Committee to adhere to these. There will normally be categories of membership and there may be others in addition to those given in the draft. Some clubs have overseas members, for example. The categories are required so that later provisions can set out the respective privileges of each category, and the rules of the club may contain different provisions for each category. This paragraph should set out the rights which each category of membership enjoys. It should not deal with matters which more properly belong in the rules. The club will require officers to carry out the management functions and they will be doing this in the name of the committee. The club may also want to appoint an honorary President as well. Club officers have special duties owed to the club and so members may not want to take on the office without being certain that they have the time and skills necessary. Officers are elected at an Annual General Meeting for a year. Some clubs amend the Constitution to provide that an officer may only stand for re-election on a limited number of occasions. The club will have a committee to make all the operating and management decisions, though some may be made by individual officers or perhaps sub-committees. The provisions in these paragraphs deal with how the committee operates. It is important that the Constitution makes it clear what powers the committee has and whether or not they are limited. The powers will, of course, have to be extensive enough to allow the committee to manage effectively. However, it may be appropriate to provide that certain decisions will require a resolution passed at a General Meeting. An Annual General Meeting will be required so that certain formal matters can be transacted including the election of the officers and general members of the committee along with approval of the accounts. Some clubs also take the opportunity of having an informal meeting afterwards for discussion of topics of interest and concern to the members. 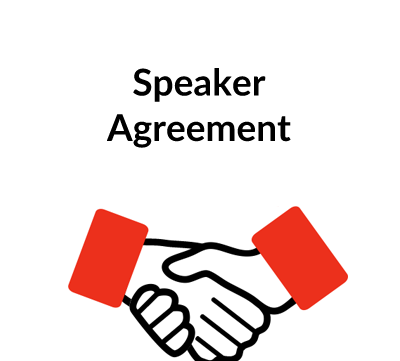 This paragraph covers the procedures for calling the meeting and how it is to be conducted. There may be a need to call a Special General Meeting to deal with important matters which are too fundamental to the club’s operations to be left to the committee alone. The Constitution does already envisage that a couple of matters should be dealt with at a Special General Meeting. There is the procedure under paragraph 10 for making amendments to the Constitution and the provisions under paragraph 15 for dissolving the club. A Special General Meeting may be called to coincide with an Annual General Meeting. As mentioned in the preceding paragraph, an amendment to the Constitution is an important matter and the majority of members of clubs will feel that they should have the opportunity to discuss proposals and vote on a resolution. A Special General Meeting should be required. The club will no doubt own property of one sort another including perhaps land. All property will belong to the body of members. Paragraph 7.2.7 gives the Committee power to appoint individual members as trustees to own a particular asset. In addition, the club may receive income from rents or deposits, and this too will belong to the members. Unfortunately, there may also be losses and these will have to be borne by the members. The club may also be handling large sums of money and in any event the control of money and finances will always be important. These paragraphs set out the basic requirements, but some clubs require others as well. It will always be best to have provisions relating to the conduct of members as sadly most clubs will experience the occasional case of a member who does not share the club spirit. The club’s rules will set out in more detail provisions relating to behaviour and so on. The Constitution deals with how offending members are to be dealt with and ensures that they receive a fair hearing in accordance with the rules of natural justice. The introduction of guests to clubs can often give rise to difficulties as there may be the view that they are using the facilities too often without being part of the club and sharing fairly the expenses of running it. Members may also be disadvantaged if there are too many guests. This paragraph sets out some of the standard provisions and the club’s rules can set out more details if theses are required. This paragraph deals with members of other clubs who are visiting the club to take part in a competition or match. They are not, of course, the same as guests. The club’s rules may make other provisions relating to the conduct of visitors. If other clubs visit often, then it may be appropriate for the Constitution to include the provision for the appointment under paragraph 5.1 of a Visitor’s Officer and the committee may want to appoint a sub-committee with special powers. Sooner or later the club will have to be dissolved and this paragraph deals with the requirements for this. The club may have substantial assets acquired over the years including land. All these will have to be disposed of in some way or another. The net proceeds of any sale will also have to be paid out and paragraph 15.2.1 suggests that all the full members at the time take an equal share. However, this may be unfair to members who have been members for many years and who feel that they should have a greater share to reflect their contributions. Some clubs may feel that the net proceeds should be paid to a charity connected with the objects of the club. There may, of course, be a shortfall. At the end of the day, it will be what the current members vote for. The Constitution is really intended for a new club which is about to be established. The founding members should have a formal meeting at which they agree to establish the club in accordance with the Constitution with any amendments or additions which they will have agreed first. The Constitution should be in its final form for the meeting ready for adoption by everybody without dissent. The new or founding members should sign a short memorandum in accordance with the form set out in Appendix A to these Notes. The founding members will then form a Committee. Alternatively, an existing club may not have Constitution at all or perhaps just have a collection of notes, and so the members may want to adopt this draft Constitution for their own club. An existing club with some form of Constitution may have procedures for this and a Special General Meeting may have to be called requiring a certain number of votes in favour of the adoption proposal. The resolution set out in Appendix B may be suitable. The Constitution adopted for use should be dated at the end so that there will be no confusion if amendments are made. The Constitution may have to include provisions relating to some or all of the above matters as well.